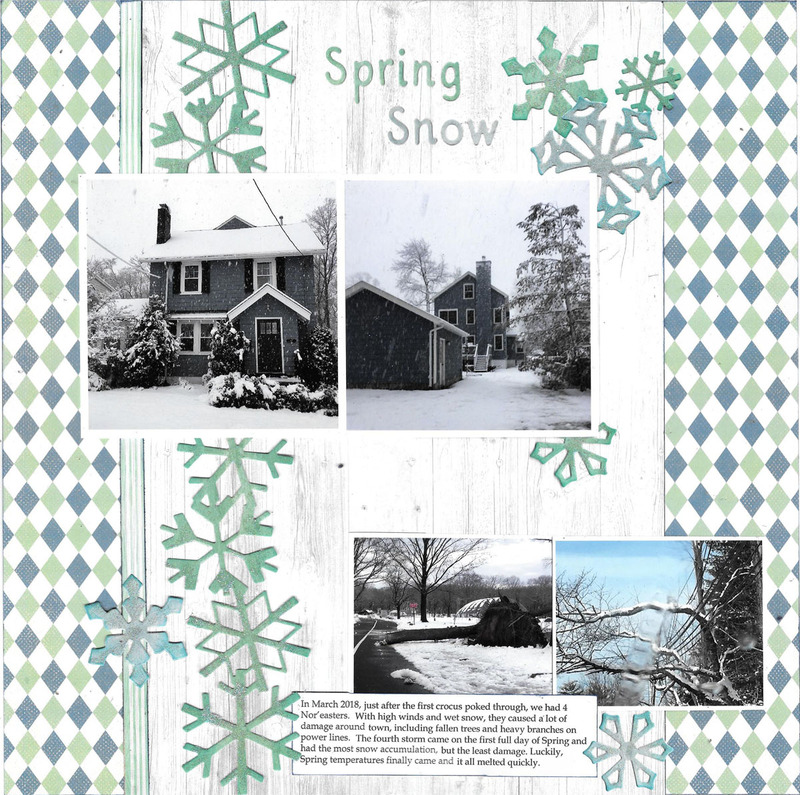 Blog Quick Quotes: Spring Snow with Louise! Hello! This is Louise hosting the Quick Quotes blog today with the new Spring Showers collection. 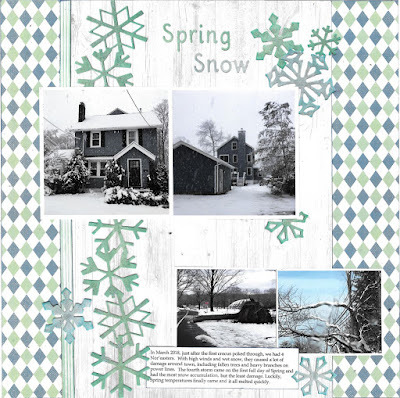 I was very excited to use this collection to scrap photos of Spring flowers that started popping through when we were hit with four winter storms during March. Luckily, the colors in this beautiful collection are also perfect for snow photos. I chose Spring Showers 103 paper for the background because the colors are perfect for snow. The wood-grain layered over it is from the reverse of Spring Showers 102. I think the vertical grain in the wood emphasizes the falling snow in the photos. The wood-grain is trimmed on the left with a strip cut from Spring Showers 101. This paper is a multi-color stripe, but I just cut the strip from the color I wanted, the greenish-blue. The edges of these papers are all inked with Powderpuff chalk ink in Deep Sea. The snow-flakes were die-cut from the reverse sides of Spring Showers 100 and 105. I inked the edges both manually and with my blending tool, using Bermuda PowderPuff Chalk Ink for Spring Showers 100 and Key Largo for 105. To finish the snowflakes, I covered them in clear adhesive and sprinkled some glitter on top. Here's a close up of the snowflakes over the stripe and wood-grain papers. The title is die cut from the same two papers as the snowflakes. 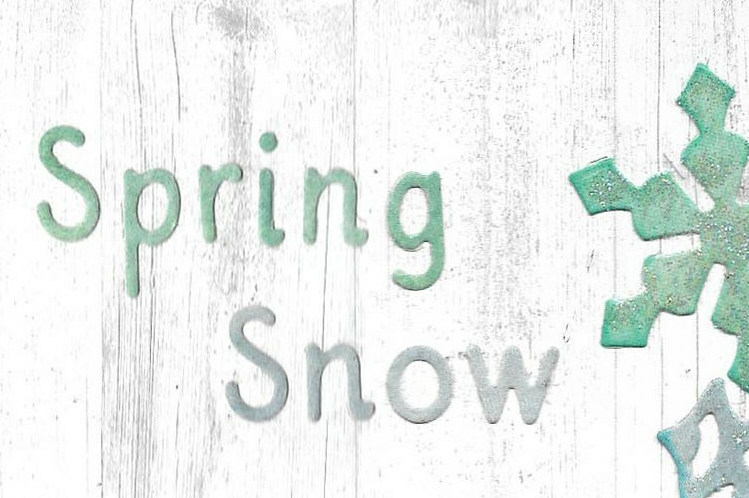 I hope I've inspired you to use the beautiful Spring Showers collection for many different seasons.